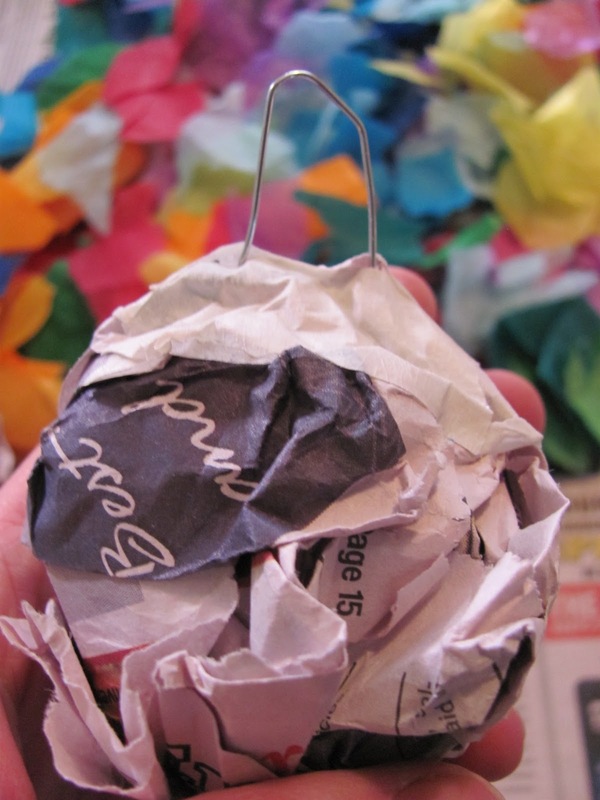 First crinkle about a page of newspaper into a ball. Try to make them hold their shape as best as you can. Then take aper clip or piece of wire (or even ornament hanger) and shape it into a triangular shape like this. 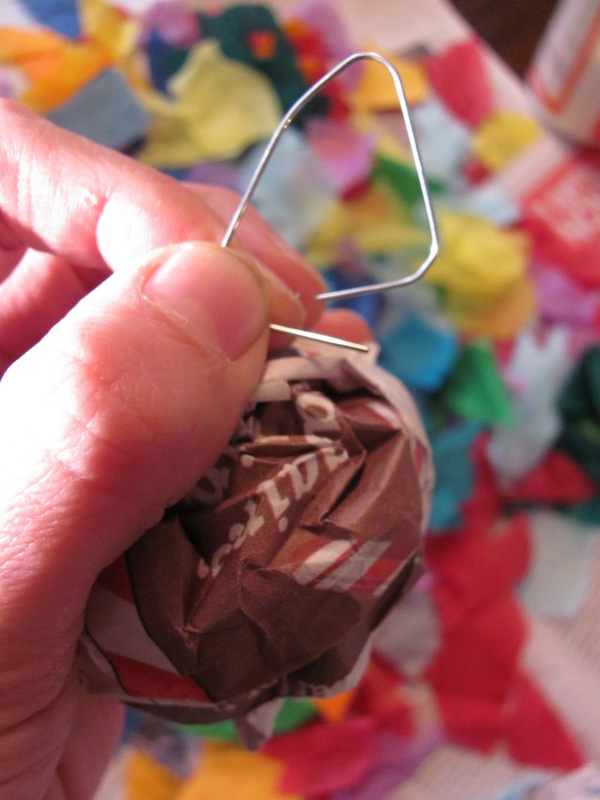 Try tucking or embedding the paper clip into the wad of newspaper and tape it into place. I added making tape on the top to so it would stay in place. Tissue paper will cove over this so it doesn't matter if you can see the masking tape now. 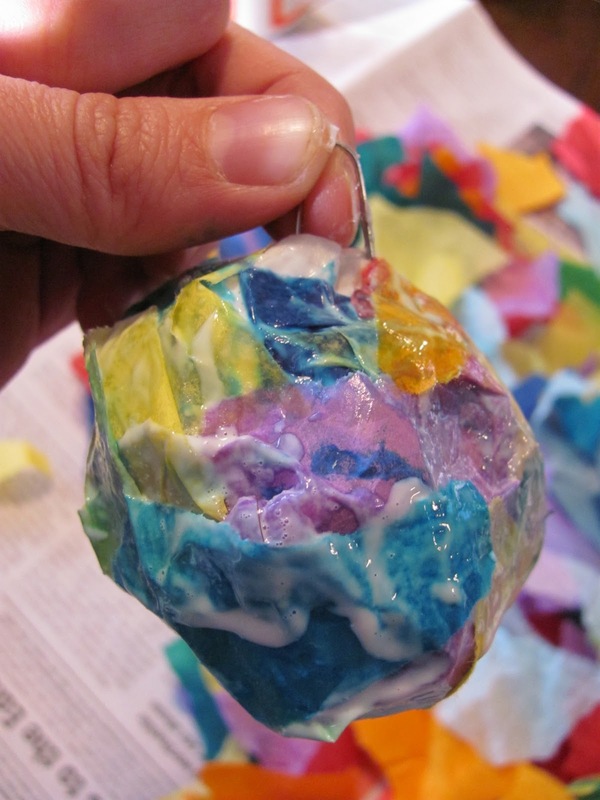 If you don't like the appearance of the ball, you can use more masking tape to help make the shape more "round". We tore up some tissue paper into small pieces first. Then take your brush and put some mod podge on the newspaper and place pieces of tissue paper over it. 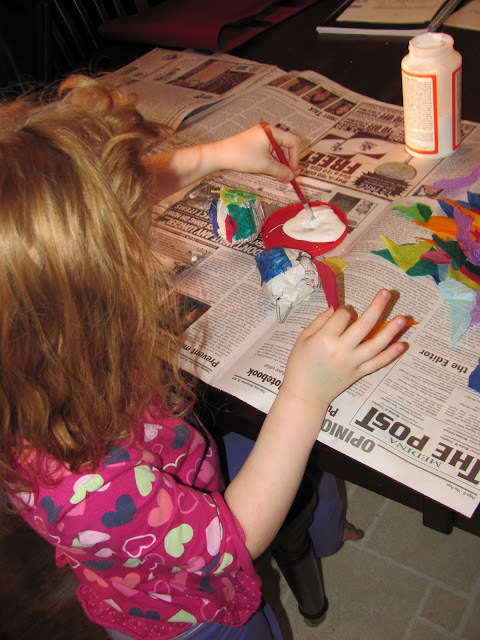 Make sure to brush over the tissue paper too with the mod podge. It gets rather messy! As you can see the mod podge is covered all over. My daughter C needed some help to get some of the spots smoothed out. We put all the ornaments on a foil lined tray so they could dry and not stick to anything!!! We added gold and green glitter to add some sparkle! Everything needs some SPARKLE! Don't you think? After they were dry, I added some ribbon as a finishing touch! Now they are ready to be given as gifts! 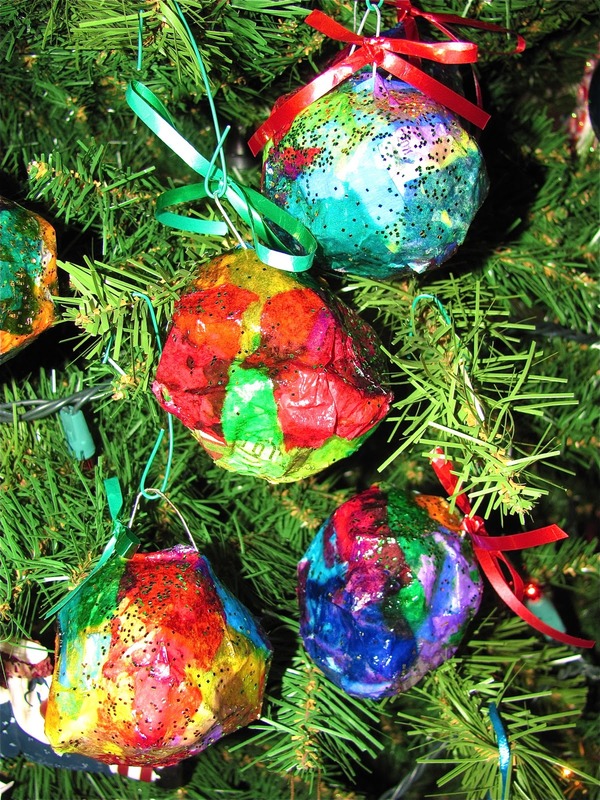 They remind me of our Tissue Paper Mache Easter Eggs. I guess we could have used little balloons too? I think they look fabulous on our Christmas Tree!!! I like the glossy shiny look of them! Can't wait to give them as gifts! I hope everyone will enjoy them! What Are Your Favorite Christmas Ornaments? Those are really sweet:) who would have thought? Thanks. How fun. I love the bright colors. Thanks for visiting my blog. You have a very sweet blog as well. I must check out more of it! These are beautiful - something more for me to 'pin' for next year! So beautuful!Thanks for sharing...maybe next Christmas I will do it with my children. These are very beautiful, and anyone would enjoy to receive these as a gift. Cassie's turned out so prettily, and I like the way they look in your photos. I do treasure handmade ornaments the most, and still have ones which my son made in preschool. I feel quite sure that Cassie's gifts will become cherished keepsakes. These are beautiful! I think they will be a great project for next week when my kids are out of school. Thanks for sharing. Without a doubt, yours, made with love, they are stunning oh and also angel ornament, I'm a big pewter angel or any other kind of angel ornament,you are gifted as a teacher and as an artist...Atta girl!